Having grown up in Nepal, Ramesh Giri knows what it’s like to not have many opportunities and resources in school. So now, as a professor of chemistry at The University of New Mexico, Giri thought of a way to give back to this community by starting a program to bring local high school students into his lab to learn about chemistry in a hands-on way. Giri, who began teaching at UNM in 2012, started the program last summer, inviting three students from Albuquerque’s South Valley Academy (SVA) to work and learn in his lab. This year, through a recently awarded grant from a National Science Foundation, Giri was able to offer the program again and brought three new students in to work side-by-side with his graduate and Ph.D. students. “I definitely feel fortunate to be here because a lot of other students applied for this program and I know this experience will benefit me later on,” said Diva Miramontes, 17, also a senior. The students are learning chemistry techniques typically done by first-year undergraduate students working in a lab. 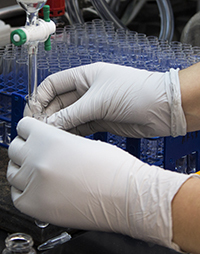 They’re being trained to run columns, check thin-layer chromatography and set up samples for an analytical method called gas chromatography–mass spectrometry; all techniques that must be mastered if a student plans to continue working with chemicals. The benefits of this effort reach far beyond the academics, too. All three of the students say they’ve been able to build relationships with the graduate and Ph.D. students in the lab, many of whom have offered help with applying for college and even tutoring for future chemistry classes. Mariah Chavez, 17, and Diva Miramontes, 17, work together to prepare a column. While the summer term for the SVA students is coming to end, Giri hopes this isn’t the last he’ll see of them. He says all the students have opportunity to continue working in the lab during the school year through an unpaid internship. 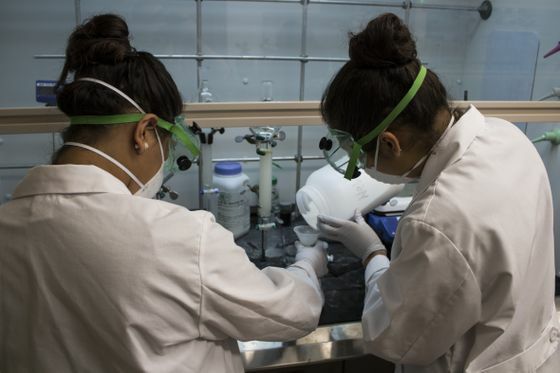 Even farther down the road, if students choose to attend UNM for college, Giri hopes they consider taking advantage of the University’s First Year Research Experience (FYRE), a program designed to get freshman undergrads into laboratory settings. “If every principal investigator starts doing what we’re doing here, I think it will be a tremendous help for students in our community to learn more about opportunities they have in college,” he said. All three of SVA students say they are already considering attending UNM after high school, and several even think they may even want to major in chemistry; a testament to the success Giri’s program has had and will continue to have on students in the community. Along with Giri’s program, The University of New Mexico offers a variety of high school experience opportunities across the entire campus, including programs through the School of Engineering, Health Sciences Center, and College Prep Program, just to name a few.